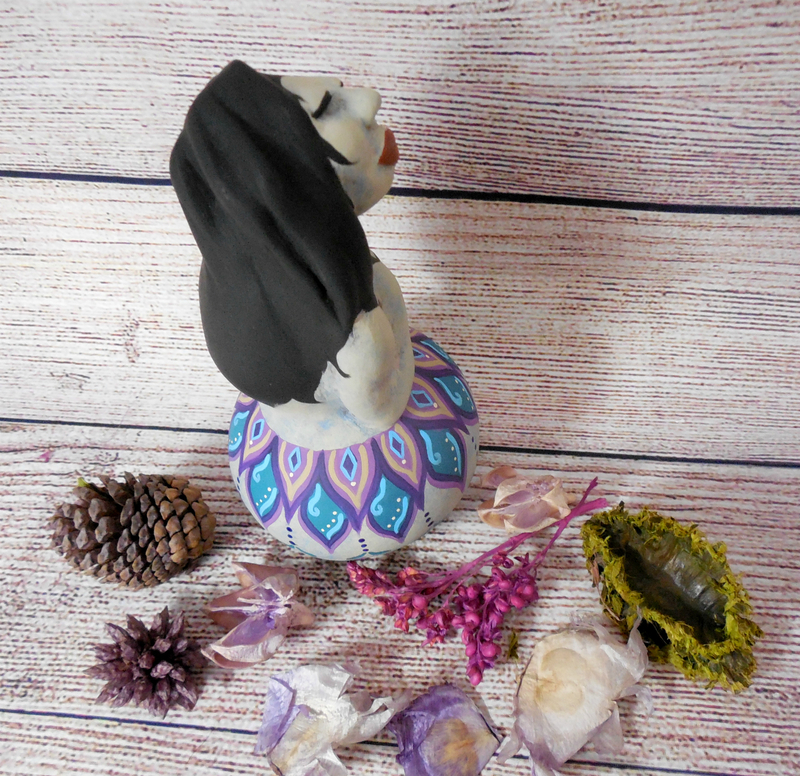 I am creating a new Series of Wisdom Keeper Art Dolls, a series of Small Figurative Sculptures of Gourd and Clay titled the "Wise Women" series. Each sculpture will focus on the Feminine and a Virtue of a Wise Woman. 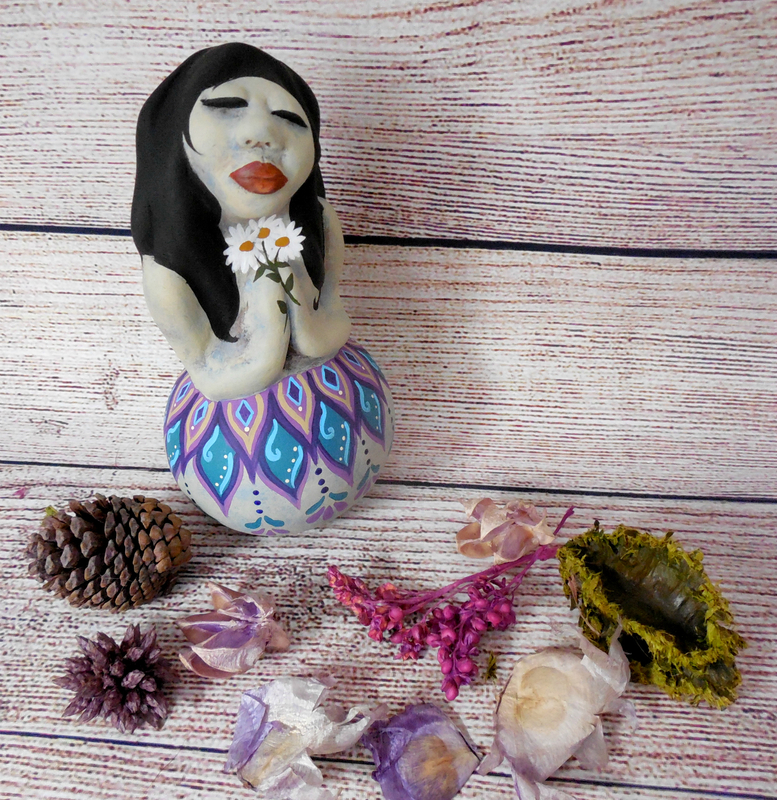 The first in the series is titled "KINDNESS", a dark haired Goddess holding a bouquet of Wild Daisies. 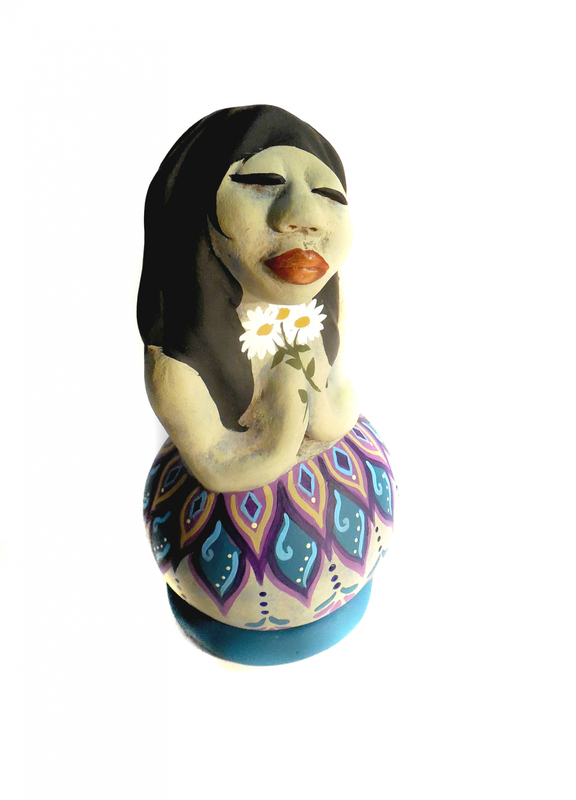 This loveable Sculpture was hand sculpted, a combination of Gourd and Clay. She is approximately 6 inches in height and 3 1/2 inches in diameter. Her arms are held against her chest. Her head is titled off to one side, and her eyes are closed while she dreamily thinks happy thoughts and about acts of loving kindness. She was painted with Acrylics, her body a blend of a Soft Grey/Periwinkle Blue/ and Cream. Her long black hair flows naturally around her shoulders and frames her face in adoration. Her lips are a Flamenco Red. Daisies are painted in her hands, for Innocence, Purity, and Happiness. A Mandala type of design is painted around her entire lower half, like a skirt. The design is done in Lavender, Pruple, Teal, Pale Blue, and Indigo Blue. 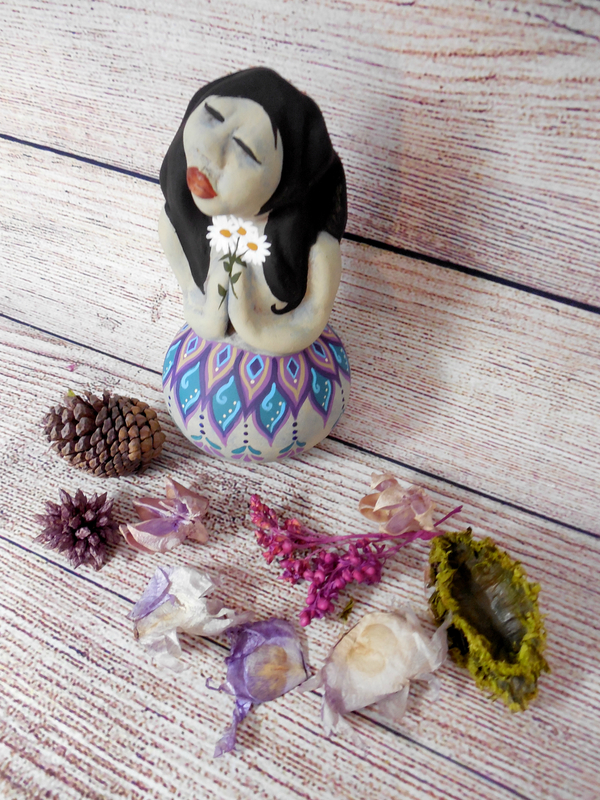 A small round Clay disc, painted a deep Teal, accompanies her as her Display Base. The base is Signed, Titled, and Numbered on the bottom. 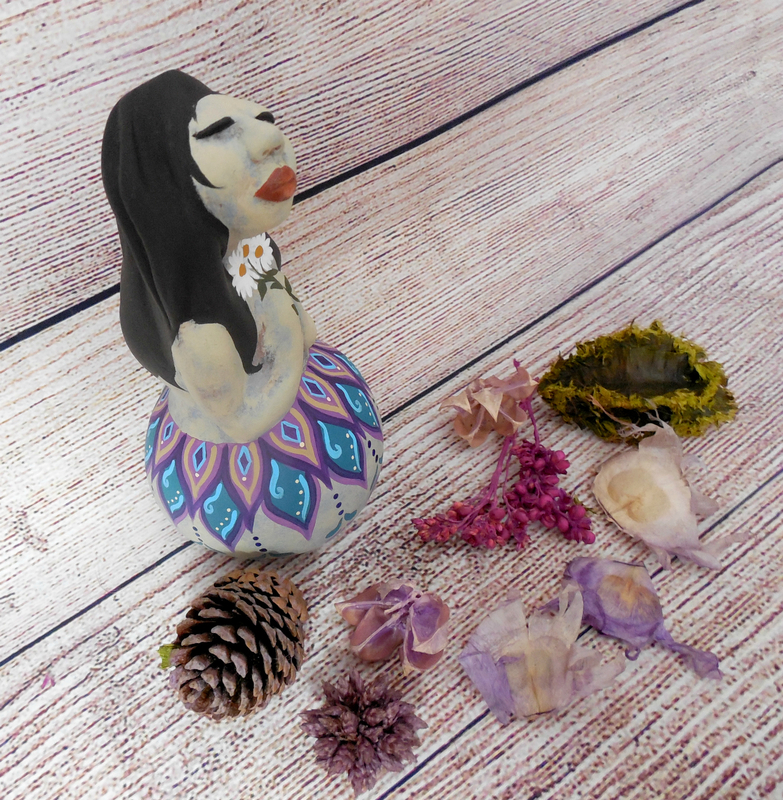 She is sealed with a soft satin finish. A Certificate of Authenticity accompanies her, with signature and short description of her. 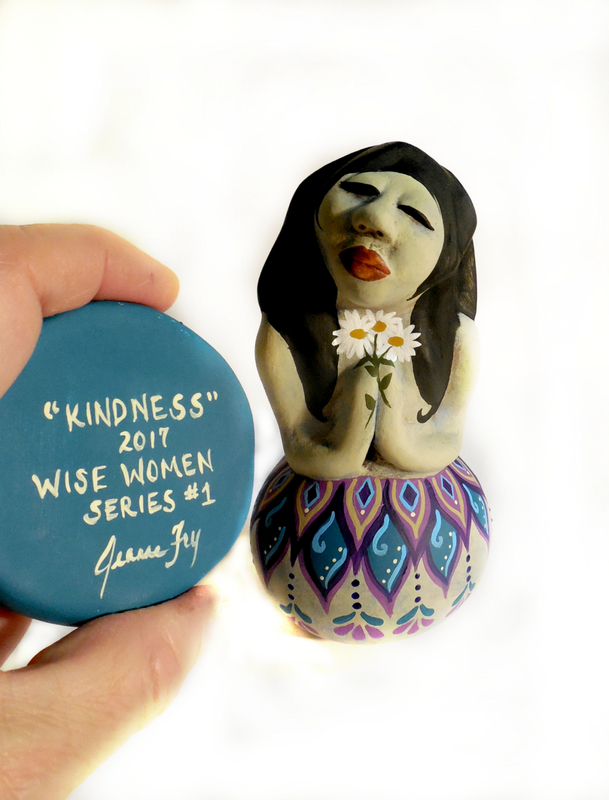 "Kindness" is #1 in the Wise Women Series. 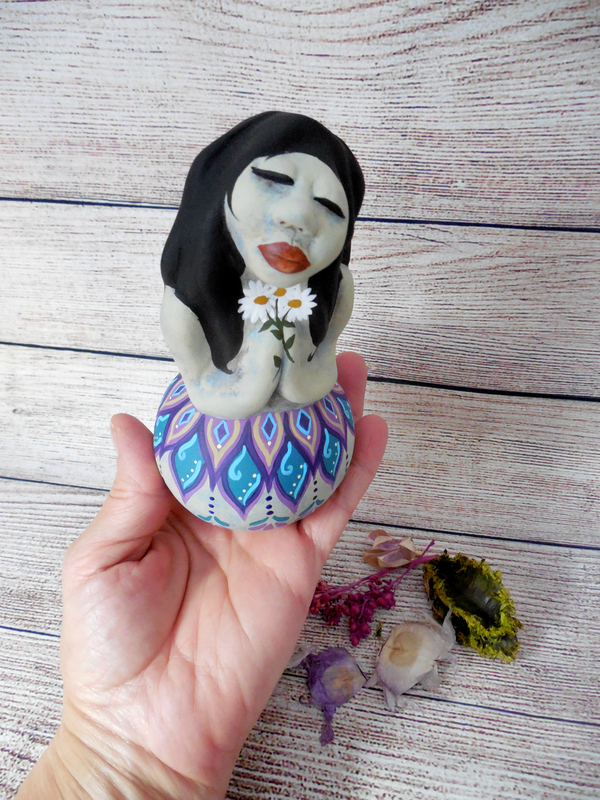 ***"Kindness" is a part of my larger Wisdom Keeper Art Doll Collection - created for Adult Collectors and Not as children't toys or decor because of small components.